Here is the image that Courtney and Simon have asked me to post to help you complete your assignment for next Tuesday. Have fun! We have been working on a mini-project on Media Literacy since our return after the winter break. Today we rolled out the criteria for the mini-project final presentation. We have sent this home with the students to discuss with you and have you sign. We are hoping that you will have many interesting conversations with your child(ren) about current events and advertising you encounter. 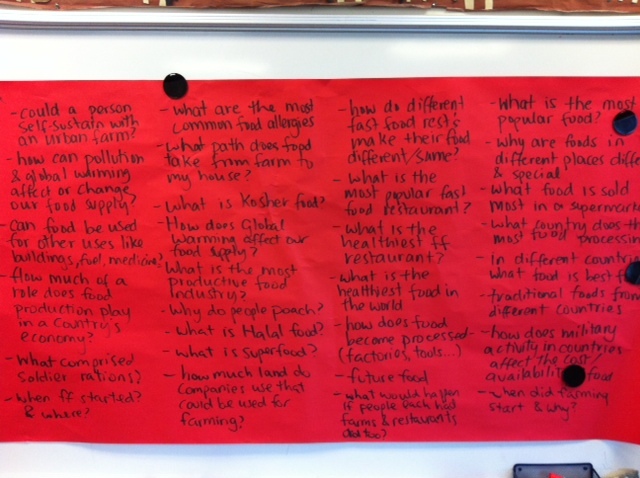 We’ve so enjoyed delving deeper into these complex and interesting topics with the two classes! The Leadership Project Criteria was released today! From now until the last week before Winter Break, we will be working hard to use our creativity and passion to represent our learning throughout the project in connection with our work with the Engineers Without Borders. Here is the criteria! One project will be completed for each group. Wow! Our objective is that the students find ways to represent the work they’ve already done throughout the project so that it meets this criteria. We are really looking forward to seeing your incredible work! 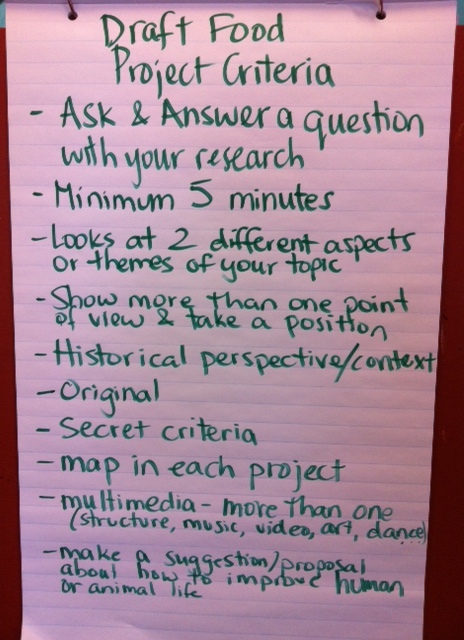 As we get deeper into our project with UBC, we will be posting more information about the final project criteria. Share your work in either a poster, a presentation or a written essay. Answer the 5Ws – Who, What When Where Why? Whew! What a process! 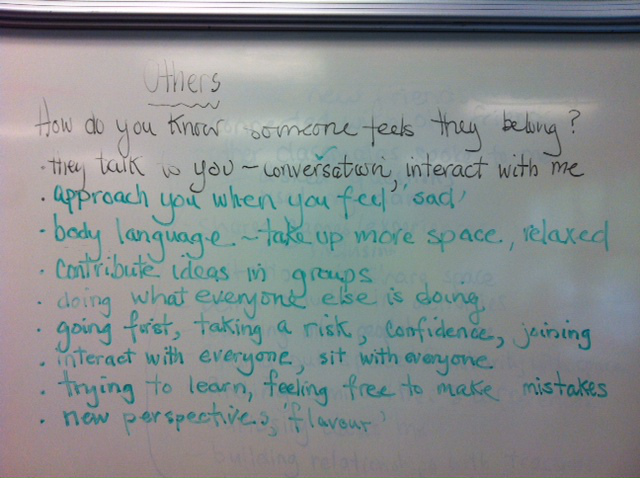 First we started by considering the English 12 First Peoples Principles of Learning. 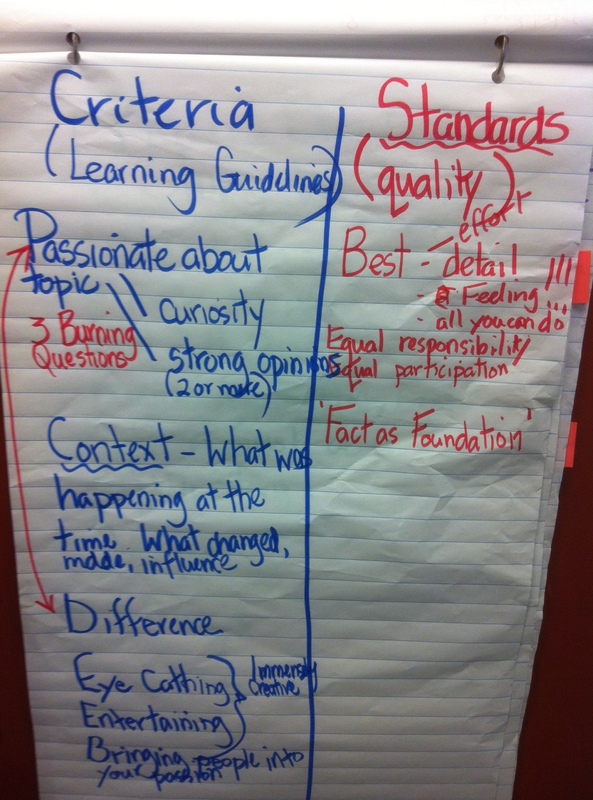 We discussed each of these Principles of Learning and what each principle meant and why it was important. Then we did some work thinking about what a statements of Division 16’s Principles of Learning might be. 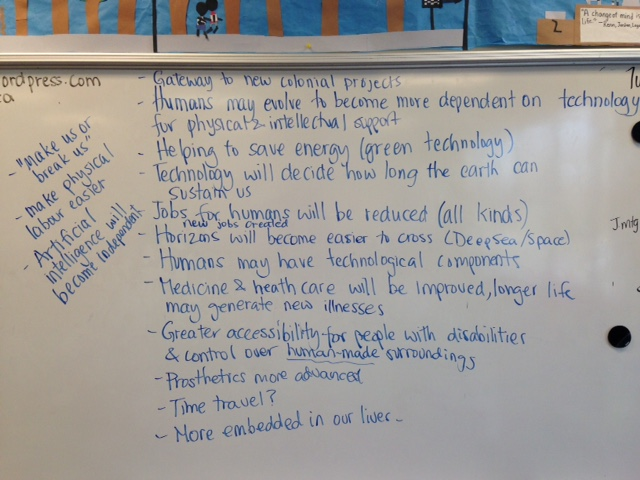 The ideas below in red were generated by the students through joining ideas together and by thinking and sharing though a whole group discussion. The class was really focused and did an excellent job of adding on, clarifying and explaining their thinking about what we valued in our learning community and why. Then we coded the draft Principles thematically using coloured dots and gave them names. For example all of the statements with yellow dots are called “Learning Choices”. We grouped the draft Principles together in ways that made sense. Some Principles went in more than one category. After that, we broke into groups and each group tackled a colour theme. The job of the groups at this time was to see if some of the Principles could be combined, or if some needed to be clarified. We tried to create a shorter list of stronger phrases that might form the Principles of Learning for Division 16. Our hopes were that the finished product would be something we could all agree with and commit to. Above are our thoughts about improving the wording and below is what the groups came up with when they tried to combine and streamline. After that, we did some last whole-class discussion to make the best and clearest wording possible. 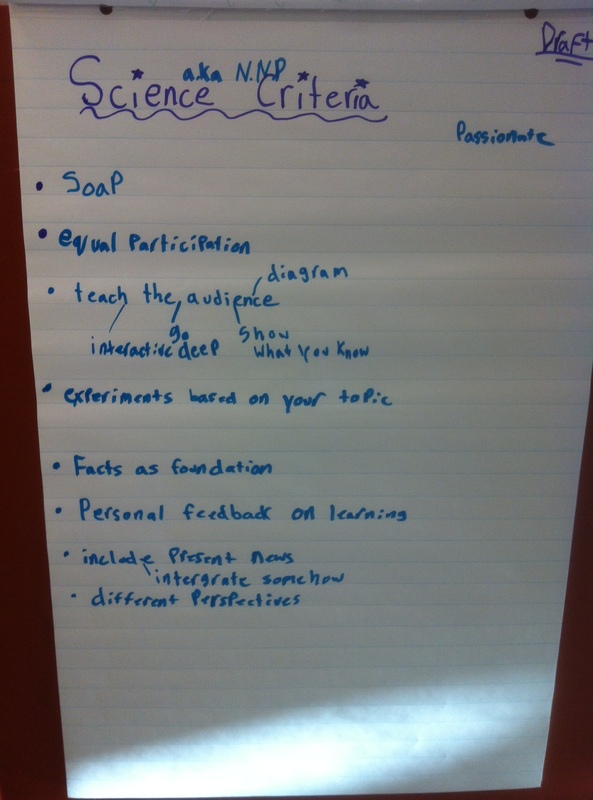 When we were finished, we adopted these Principles of Learning for our class. We hope that this will guide us through the upcoming year. They will be the foundation for our Wall Projects! The relationship between teacher and student is important because if there is no relationship there can be no respect and they might not respect one another or learn from one another. But if there is a relationship, you can understand each other and not be afraid to ask for help. When you are really keen on something it opens you up to all sorts of knowledge. Knowledge gives you all sorts of opportunities. Being curious helps you embrace learning and it is OK to be curious. This is important because it’s another way of getting knowledge and helps you find different ways of learning things. Without curiosity, you might not want to learn things beyond what you already know. You must respect other people’s differences to learn with them and be in a group with them. Without that, you cannot have a healthy community. This principle is important because it helps us all to have a better learning experience. If you do something wrong then smaller or younger students will think it’s okay and follow your example. However, if you do something good, other people will do that too, so it goes both ways. It’s important to make good choices in learning because it could come in handy in the future, and helps us to be good role models. This basically means that you should take risks and if you make mistakes you should learn from them. It’s important because it teaches you lessons so that you can make fewer mistakes when you are doing something you know how to do. It’s also important to take risks because that’s when the biggest learning can happen, when we try something new or do something in a different way than we have done it before. You must contribute to helping your community grow and get stronger. You have to commit to the learning process to help make your learning community do better. Being part of a community means everyone has a role to play. Everyone contributes because we are all counting on each other. This is important because it’s true in all communities. You must try in order to learn. When you are learning with other people you have to respect and include them which might mean respecting others’ differences because not everyone is the same. When you are choosing groups at school, make sure everyone is included. It’s important because if you don’t include others you wont get to hear their thinking and you won’t be respectful. It’s an obligation to understand that other people bring different things and it’s each of our responsibilities to include others. This means to respect others’ ideas and take them into consideration. When we look at the ideas of others, it can make our ideas stronger. It’s nice to listen to others. When people offer you comments and feedback, it’s to help you learn, and it can sometimes help you avoid problems and do better each time you try something. If you rush through your learning, you won’t have as good of an experience and won’t learn as much. When you learn slow, and are patient, you learn more things. Sometimes you think you know something, but when you get to the end you realize you didn’t actually know it. Don’t stress out or it gets worse. If you think you’re supposed to know everything and you think you should be able to know everything without practicing, you might get angry with yourself and rush more and more. When you go slower you actually learn things faster. When it comes to being patient and learning, some people want to be the first one done but it affects the learning. Embracing each others’ ideas means to respect each others’ ideas and thoughts. It’s important because we embrace others to work hard. If we embrace each others ideas, then the person who was sharing knows they’ve been heard. Embracing your own ideas is about having the courage to share your ideas in front of others. This means that everyone should be a leader because everyone built it and we should all care for each other in our community. We think that it is important to take pride in your learning community because there will be people around you who want to learn with you and help you. If you are not connected with other people around you then there is no chance you could learn from one another and less learning can happen. It’s important to be connected with others around you and to learn from each other. The elders are older and can teach youth more things from their childhood. When they talk they make a bond. It’s important because the bonds make friendship and that helps other people make new friends, it helps to start a new bond. The students are working on their 20 second speeches. We do not yet have a due date, but the students will have plenty of time to work on their speeches and practice this week and part of next week, but the expectation is that they will do some practicing at home and will ask parents and siblings for constructive feedback. Depending on their progress and our ever-changing schedule, I anticipate a due date near the end of the month. We do this early in the year because it gives the students a short and confident opportunity to get up in front of the class and share something personal with the group. It is a positive experience and there is a lot of support in the group. Today we revealed the Hydrosphere Project Criteria. There will be time to discuss, research and plan over the next few weeks. Choose a water form to explore and research. Be specific! Deadlines will be discussed tomorrow! Welcome to our new students and our new families. Thank you for coming in and checking out our blog. Please click on the link on the homepage to follow our site. That means you will get an email every time we create a new post. Please visit our link at https://dickensdiv16.com/2015/03/05/student-vote-video-at-last/ to learn about our most recent experience with the Student Vote program. I’ll post about our next project when we are prepared to share the criteria! Tami, Karim and I are super excited about starting it. OK. We are very excited. Each team will make a brief presentation to the class on their current technology mid-way through the project. Equal participation is required. You must list all resources used in researching your technology. All writing must be in your own words. This project will likely continue through into Term 3. Information about deadlines and timelines will be forthcoming. We are just starting a new project that will likely continue into third term while our student teacher, Carl, increases his teaching time with Division 16. This project will have us exploring current technology and looking into the future of our relationship with technology. This project will have a written component, an imaginative component, and an artistic / presentation component. In the spirit of “no spoilers”, that’s all I’m going to say, but please ask and engage your student in conversation about our current relationship with technology and what benefits and concerns it may raise for us. I’ll post the criteria and timelines when we are ready to begin the independent work. Very exciting! These were some of our ideas. We are working on expanding some of the benefits and concerns around these ideas in the coming week. We are very excited to have begun a new project with Tami and Karim’s class. We are focusing a bit more on Social Studies this term with a focus on Fine Arts in the presentation. We have discussed the criteria with the students and have had a number of guest speakers visit the school in order to bring personal connections to moments in Canadian History and to help make historical moments come alive. Our guest speakers have included topics such as the Women’s Vote, Worker’s Rights, Residential Schools, Frontier College, the history of Public Education, Canadian Immigration, the creation of Stanley Park. Please take the opportunity to talk with your student about moments in Canadian History that are important and meaningful for you. Due dates will be discussed with the class as the project progresses. Please watch this space for updates on timelines and mid-point expectations. We are hoping to share our progress at Spring conferences. 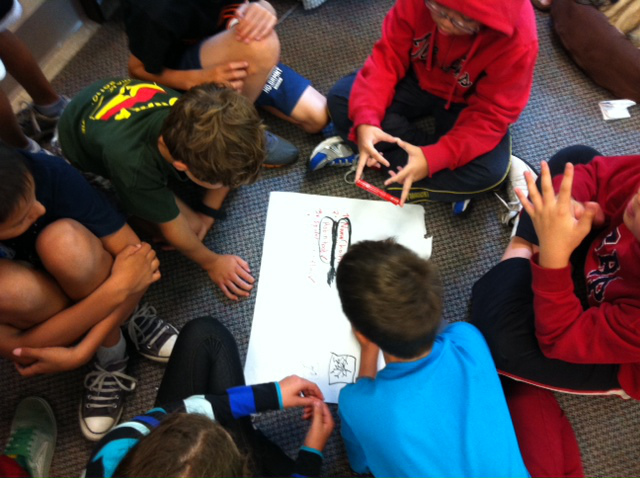 This week, we began a Math Project that will be conducted in our Grade groups from last term. I’ll keep working with the grade 5s, grade 6s will work with Tami and grade 7s will work with Karim. Math Measurement curriculum at the Upper Intermediate level requires knowledge of 2D and 3D shapes, circles, angles and comparisons. create a poster to share the measurements you’ve collected. This week and next week, the students will be working on 20 second speeches. These are short speeches written and presented to the class on a topic of the student’s choosing. The speeches must be interesting, have a personal connection, use 1 prop, have a beginning, middle, end, and open with a hook. The expectation is that the speech will be well practiced or memorized if possible. This is a great chance to practice effective communication, to write for the purpose of presenting, and to give students good practice speaking to larger groups of students. There will be class time to write, edit and practice the speech, but the expectation is that students will also practice at home. Parents and siblings, please feel free to give feedback! We are participating this fall with Chloe and Peggy’s class in a Nation-wide program put together by CIVIX called “Student Vote” You can find more information about the program here. We are super excited to be participating in the program this year focusing on the Municipal Election next Saturday. Three Dickens divisions participated two years ago for the Provincial Election. There are a number of learning activities we will be undertaking to prepare the students for two things: to become knowledgeable about Canadian democratic processes and to make an informed decision when they cast their votes on Friday, November 14. Part of our study includes learning about different governments including democracy, levels of government, responsibilities of local (municipal) government, researching candidates and issues, and learning about the voting process. Students have also had homework on the class blog to engage with media about the upcoming election. I have invited School Board Trustee Candidates from each party to speak to the students about their platform and the decisions that led them to run for an elected municipal position. We were taken up on this invitation by Gwen Giesbrecht from the Public Education Project, Patti Bacchus and Mike Lombardi from Vision Vancouver and Mischa Oak from the Green Party. 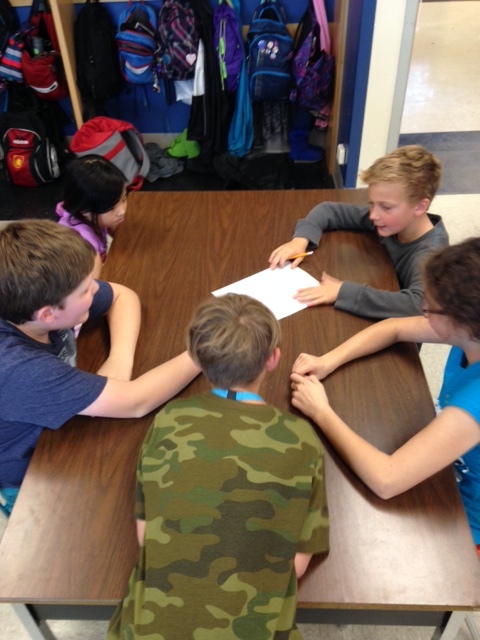 Friday, the students will be participating in a vote using ballots that reflect the actual Vancouver candidates for City Council, School Board and Parks Board. Results will be tallied by the fine folks at “Student Vote” and released the day after the actual election. Please take the opportunity to discuss the upcoming election with your student. If possible, take them with you to All Candidates Meetings and to the Polling Station. Last week the students did some amazing thinking about Learning. 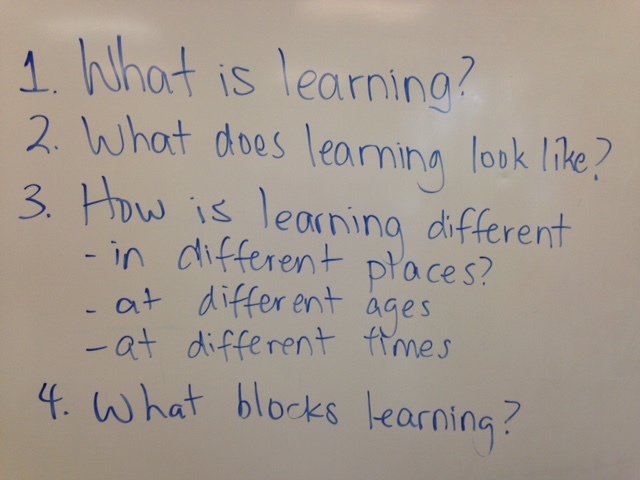 We spent a bit of time working on the questions about learning in the post below. 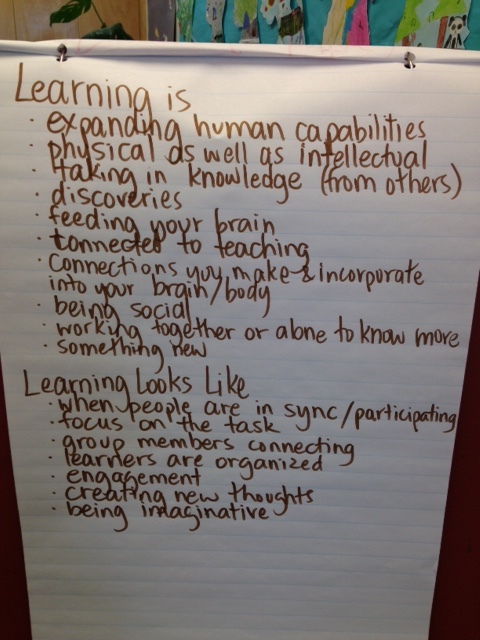 After some discussion, we built a list of things we believe in about learning. This will form the basis of our Wall Projects, which we hope to start soon. Amazing work, Division 16. 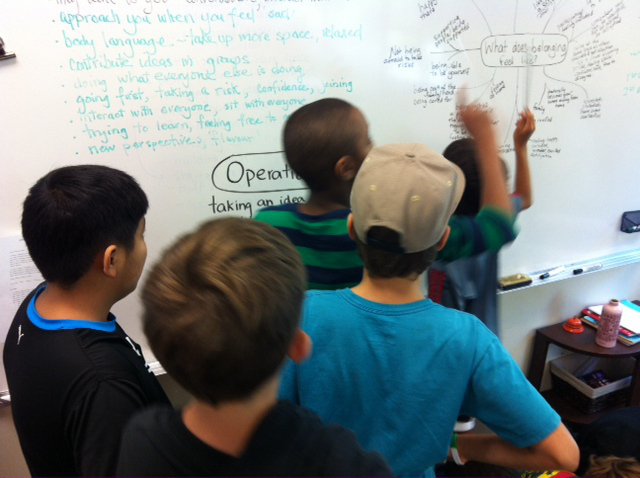 I’m so proud of you as a community of learners coming together to share ideas and build consensus. How can learning be different? We will be discussing this thread in more detail. These discussions will form the basis for the theme of our Wall Projects. Stay tuned for the criteria. We are very excited to be starting our Wall Projects – an activity where students, in groups, make giant art that remains on our walls for the entire year and represent the values of our class. This year we began by watching a video by a British economist outlining her 7 dreams for a better world. 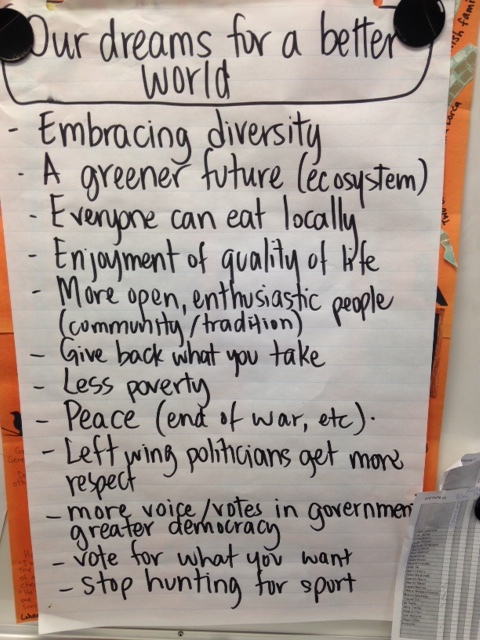 Much amazing discussion ensued, and the students came up with a number of their dreams for their better world. What great thinkers and learners! Later this week we will talk more about learning and our dreams for learning. This will form the foundation of the Wall Project Criteria. Can’t wait to update more on this later. Math groups are underway. 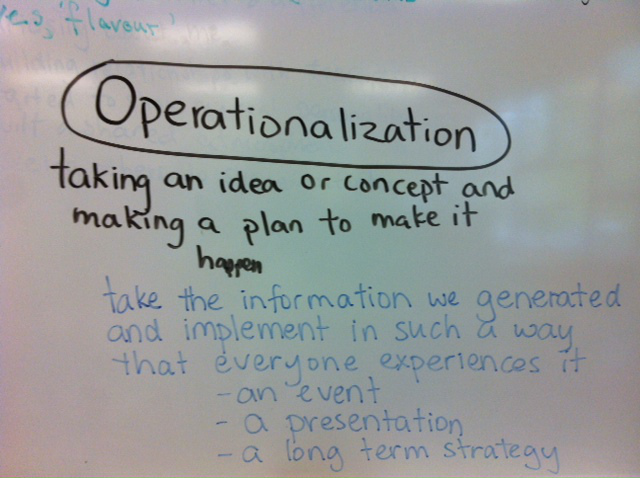 Between our three classes (Division 16, 17 and 18), we are beginning the year off by focusing on Number Operations. While the intermediate math curriculum is varied, exciting and interesting, we have found that ensuring all students have a solid foundation in addition, subtraction, multiplication and division supports the learning throughout the math curriculum areas. At each grade level for the start of the term, we will be focusing on helping students gain a good understanding and to practice their skills in these areas. We ask for your support in assisting them with any math homework, including 10 minutes a night of multiplication practice for grade 5s and 6s. The grade 5s and 6s are beginning with a review of Place Value. We love Math here. We do nearly an hour of Math each day. We have just begun a year-end “Anything” project. The framework for the project is “Beginnings and Endings” – so the students can choose any topic or area of interest and work through the framework to meet the criteria. * Show the “middle” – give some context. If students choose a Beginning event, they need to show a bit of what comes after, and if they choose an Ending event, must show a bit of what came before. I’m really looking forward to ending our year together and the new beginnings that will follow! Wow! What a big deal this new Project is! We have taken a couple of weeks to get things going, and have been working on our note-taking skills in preparation for this project. We have done some brainstorming for ideas for this project after watching some videos and doing some reading and some discussing and some writing. 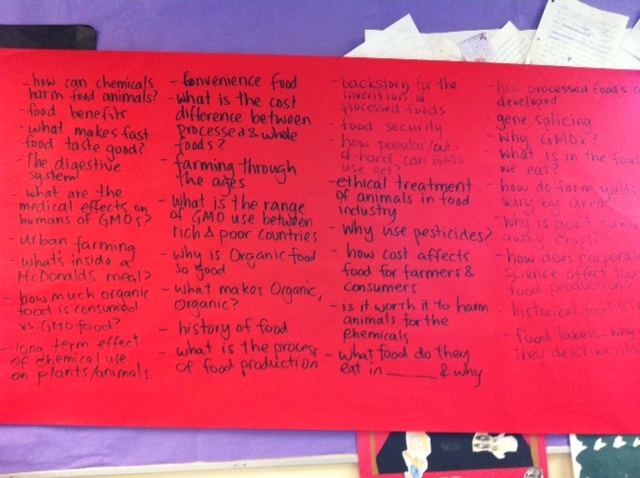 We have mostly formed our groups and are working on putting our topics for study together. We have a draft set of criteria. We will be discussing this again later this week to try to reach consensus on the criteria. Please come on Thursday prepared to have more discussion on the topic. On Wednesday, your job will be to come up with a way to creatively share your question for study. This week is a big week for Vancouver. Along with many cities across Canada, we are hosting events related to the work of the Truth and Reconciliation Commission. The Truth and Reconciliation Commission was created in 2008 as part of the court-approved Residential Schools Settlement Agreement negotiated for former students, legal counsel for churches, the government of Canada, the Assembly of First Nations and other Aboriginal organizations. The purpose of the Commission is to create a historical account of Residential Schools, help people heal, and encourage reconciliation between Aboriginal and non-Aboriginal Canadians, as well as to host events across the Country to raise awareness about the Residential School system and its impact. The events this week in Vancouver have provided us with an opportunity to participate in these historic events as well as to build on these events in our classroom discussion. We have been looking at timelines in Canadian Aboriginal history and considering the Apology offered by the Federal Government to the Aboriginal peoples of Canada. We will be talking further about the concepts of restorative justice and Aboriginal history. This term has started with a bang! We began the year operationalizing the idea of “belonging” – investigating what belonging feels like and preparing activities to welcome the new students in our class. We have been teaming with Laurie’s class (Division 15) and wanted to do the best we could to develop a welcoming community. 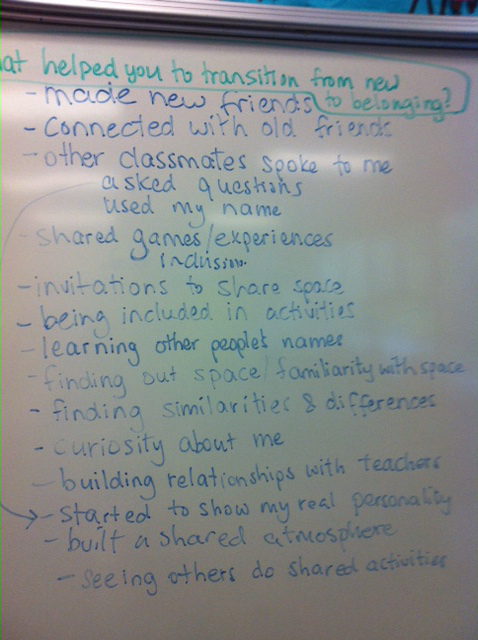 The students from last year’s Division 15 and 16 considered what belonging feels like, and how we felt when we began to belong in our classes when we first arrived. After that, we thought about how you can tell when others feel they belong. Then, in groups, we worked on presentations, events or strategies to help our new classmates feel they belong. Over the next two weeks, the students led lunchtime games, art lessons, “envisioning” activities, presentations, songs, class tours and a show & tell learning opportunity. We are also working on our 20 second speeches. The students are working on writing, editing and presenting a 20 second speech. We will begin presenting on September 18th. We are learning about the legacy of Residential Schools in Canada, and will be participating in two Truth and Reconciliation events next week. Our student teacher, Jennifer, will be working with us on French, PE, Science, Language Arts and Math until November 29. We have started our Theme study, and today we shared understanding of the two ideas in our category, “Technology” and “Design”. We have started a new project with Laurie’s class, yet unnamed but based on the four areas of the science curriculum: Life Science, Physical Science, Earth and Space Science and Scientific Skills and Processes. We have formed groups and mostly chosen topics of study. The research has begun. We are aiming to finish in the week of February 20th, but that deadline is up in the air. We are now building our criteria for the project. Here’s what we have so far. Stay tuned! 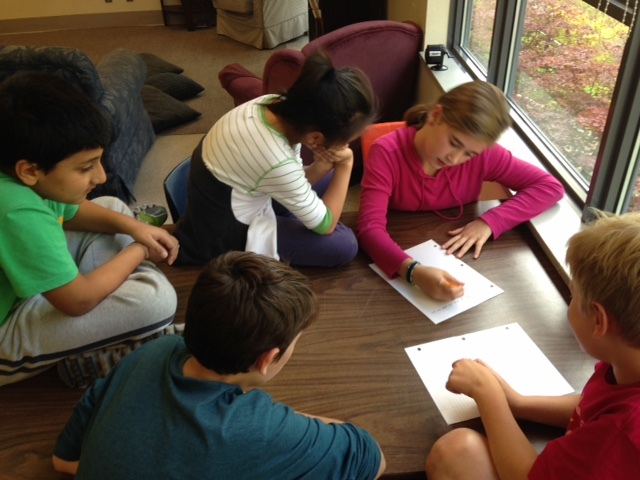 On Wednesdays to Fridays, we have been working on Integers in Math. For us, the study of Integers includes understanding the relationship between positive and negative numbers and completing computation with those numbers. 4. The meanings for the operations that apply to whole numbers, fractions, and decimals also apply to all integers. Each meaning can be represented by a model, although some models suit some meanings better than others. 3. A negative integer closer to 0 is always greater than a negative integer farther away from 0; for example, -7 > -10. 3. The sum of a negative and a positive can be positive or negative. The sum has the sign of the number that is farther from 0. Our math curriculum focuses on BIG IDEAS – the imporant things to know and understand deeply across the grades. Of these strands, number is the key area of focus arcoss the grade levels. The curriculum is deisgned to support students in developing solid number sense – critical to mathematilcal competence and success. In this curriculum, there is a focus on developing number sense and algebraic reasoning. A child with number sense can be flexible in their approach to problems. They can use numbers in different contexts and for different purposes. For example, a child with number sense can add 46 + 57 in many different ways. Think about this yourself. How many ways can YOU add these numbers? Did you add 40 and 50 to get 90 and then add 6 and 7 to get 13 then combine the two sums for a total of 103? Did you round the numbers to the nearest ten, to make 50 + 60 and then subtract 7? Did you take 3 from the 46 and give it to the 57 to make 60 then add 43 and 60 to get 103? A child with well-developed number sense will be able to think in these ways, and to see the connections between these solutions. Why focus on flexible thinking? Schools value thinking and learning. Our curriculum asks us to assess how well children can reason, problem-solve and communicate their thinking. When children share different ways to solve a problem, they stabilize their learning. Using language to explain our thinking helps the brain make connections. These connections are firmed up while we puzzle through more than one way to solve a problem. With the implementation of this curriculum, your child will be asked to explain her thinking and show her work in more than one way in math. You may notice that there are fewer questions being asked, but greater depth expected in the answers. The problems they will be asked to do may feature different correct answers and many ways to solve them. focus on understanding – not tricks! can you talk about your thinking? can you draw your ideas? Can you build it with materials? Can you show me HOW you know? What strategy did you use to solve this problem in your head? How is this like something you have done before? If you have a negative attitude about mathematics, chances are your child will too. Help your child have a “can do” attitude by praising your child’s efforts as well as her accomplishments. Acknowledge the facts that mathematics can be challenging at times and that persistence and hard work are the keys to success. Relate math learning to other endeavours that require hard work and persistence, such as playing a sport. Struggling at times in mathematics is normal and is actually necessary to, and valuable in, understanding mathematics. Every day, people face situations that involve mathematics, such as deciding whether one has enough money to purchase a list of items at the store, reading a map to find out where one is, building a budget, deciding on the shortest route to a destination, developing a schedule, or determining the price of an item on sale. Help your child realize that mathematics is a significant part of everyday life. Suggestions for discussing mathematics with your elementary, middle or high school child during everyday activities are listed at the end of the section. Play board games, solve puzzles, and ponder brain teasers with your child. Your child enjoys these kinds of activities while enhancing his mathematical thinking. Point out the mathematics involved, and have your child discuss the strategies he used. Mathematics is foundational to a wide variety of interesting careers. Research different careers with your child, and find out what she should be doing now to prepare for these options. Traditionally, in North America the belief that only some students are capable of learning mathematics has prevailed. For example, tracking has consistently disadvantaged groups of students through classes that concentrate on remediation and do not offer significant mathematical substance. Many students, especially those who are poor, non-native speakers of English, disabled, female or members of racial minority groups, have become victims of low expectations. Today we are guided by a vision of mathematics for all. You would not expect your child not to read; similarly, you should not expect your child not to do mathematics. Your attitude and expectations are crucial to influencing the future oppotunities for your child. Communicate high expectations to your child and his teachers, counselors and administrators. Make sure that your child is getting the same opportunities in mathematics as everyone else, and is taking challenging mathematics classes each year, all the way through high school. On Wednesdays through Fridays, we have been studying Patterns and Algebra in Math. This topic starts with learning to recognize repeating patterns using shapes and numbers and then moves on to representing patterns using variables. Marian Small organizes math through the use of “Big Ideas”, and we use these to structure our learning. 1. Patterns represent identified regularities. There is always an element of repetition, whether the same items repeat, or whether a “transformation”, for example, adding 1, repeats. 4. Many geometric attributes, measurements, and calculations involving numbers are simplified by using patterns. Algebraic thinking flows from work on patterns. 2. Using variables is a way to efficiently and generally describe relationships that can also be described using words. On Wednesday and Thursday afternoons, we have been working with Division 15, Laurie’s class, on what the students have started calling “Super Projects”. These started early in September. Students have chosen “a person who made a difference” on whom to research and create a presentation. Many students are working in groups and many are working alone. We haven’t yet set a due date for this project, but they promise to be fantastic. Parents, please save and send in any cardboard you can find. 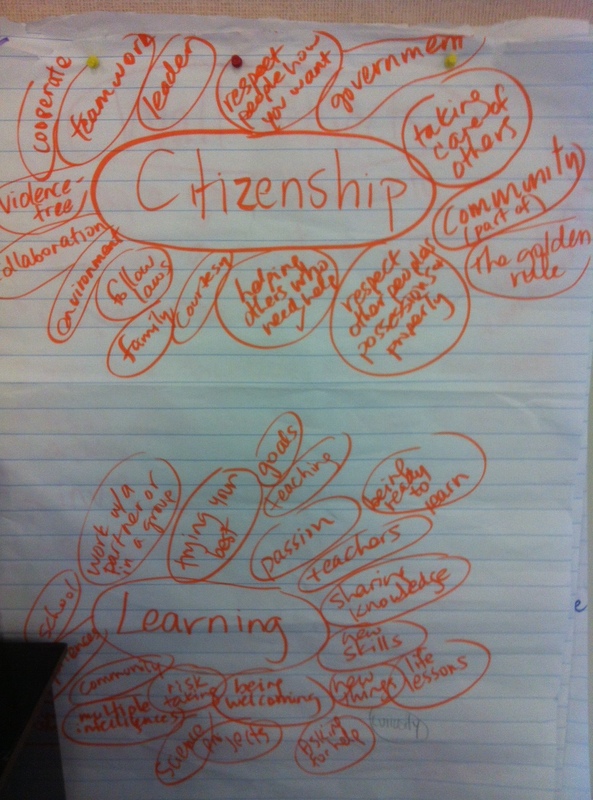 Together, then in groups, the students are considering the concepts of “Citizenship” and “Learning”. They will be working on large scale representations of these concepts for display year-round in our classroom. While we will be sad to see last year’s Wall Projects come down, we are looking forward to the new ways we will find to conceptualize our community. Hey Jody can u post the criteria for Rock and Roll Hall of Fame. I just wanted to check up on the criteria for seeing if my project meet the criteria! Thanks for checking your work against the criteria! Great work! I cannot Find it. It is not on the website.. Can you post it? I am so excited to see how the T.M.I.H. project turns out!!!!!!!! !